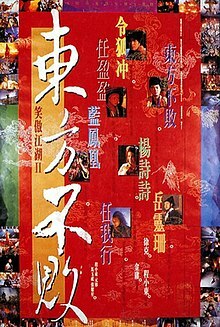 Swordsman II, also known as The Legend of the Swordsman, is a 1992 Hong Kong wuxia film very loosely adapted from Louis Cha's novel The Smiling, Proud Wanderer. It was the second part of a trilogy: preceded by The Swordsman (1990) and followed by The East Is Red (1993). Directed by Ching Siu-tung and Stanley Tong, Swordsman II starred Jet Li, Brigitte Lin, Rosamund Kwan and Michelle Reis in the leading roles. Linghu Chong, Yue Lingshan and members of the Mount Hua Sect are planning to retire from the jianghu (martial artists' community). They learn that Dongfang Bubai has seized control of the Sun Moon Holy Cult and is secretly plotting with some Japanese rōnin to rebel against the Ming Empire and dominate China. Dongfang Bubai had castrated himself in order to master the skills in the Sunflower Manual, and his appearance has become more feminine, even though he is now a formidable martial artist. Linghu Chong meets Dongfang Bubai by chance without knowing his true identity, mistakes him for a beautiful young woman, and falls in love with "her". Dongfang Bubai knocks out Linghu Chong while he is not looking and imprisons him in an underground dungeon. In the dungeon, by coincidence, Linghu Chong meets Ren Woxing, Ren Yingying's father and the former leader of the Sun Moon Holy Cult. They escape from captivity together. One night, while Linghu Chong is distracted by Dongfang Bubai's lover Shishi, Dongfang tracks down his Mount Hua Sect fellows and kills them. Linghu Chong brings Yue Lingshan, Ren Yingying, Ren Woxing and Xiang Wentian with him to confront Dongfang Bubai at Black Woods Cliff. In the ensuing battle, Dongfang Bubai apparently dies after refusing Linghu Chong's help and falling off the cliff. Ren Woxing regains control of the cult and starts killing the traitors who defected to Dongfang Bubai. Linghu Chong and Yue Lingshan secretly escape with help from Xiang Wentian and Ren Yingying because they know that Ren Woxing cannot tolerate them. Jet Li as Linghu Chong (Ling Wu Chung), the most senior member in the Mount Hua Sect. Brigitte Lin as Dongfang Bubai (Invincible Asia), the leader of the Sun Moon Holy Cult. The character is voiced by Faith Minton as a male and Nicole Kidman as a female in the American dub. Michelle Reis as Yue Lingshan (Kiddo), Linghu Chong's junior. Rosamund Kwan as Ren Yingying, Linghu Chong's love interest and Ren Woxing's daughter. Waise Lee as Fubu Qianjun (Hattori), the rōnin chief and Dongfang Bubai's ally. Chin Kar-lok as Yuanfei Riyue (Saru), Fubu Qianjun's henchman. Lau Shun as Xiang Wentian (Zen), an elder of the Sun Moon Holy Cult who remains loyal to Ren Woxing. Fennie Yuen as Lan Fenghuang (Blue Phoenix), Ren Yingying's subordinate. Yen Shi-kwan as Ren Woxing (Wu), the former leader of the Sun Moon Holy Cult who was overthrown and imprisoned by Dongfang Bubai. The character is voiced by either Sean Connery or Peter Cullen in the American dub. Candice Yu as Shishi (Cici), Dongfang Bubai's lover. The United States version has nine minutes of the original film cut and was released under the title Legend of the Swordsman. It is dubbed in English and retains the original music score. The Hong Kong version is in Cantonese and it retains the nine minutes of extended footage and gory violence. The Taiwanese version, which is dubbed in Mandarin, contains an additional four minutes of rare extended and gory footage that was removed in the United States and Hong Kong releases, bringing the total runtime to 112 minutes. It has some different music scores and features Jet Li's original voice. And as aired in CTS Taiwan for many times. In the Mandarin-dubbed version of the film, Rosamund Kwan and Fennie Yuen speak Sichuanese instead of Standard Mandarin. This was meant to enhance the fact that their characters are of the Miao ethnic group. The theme song of the film, Xiao Hongchen (traditional Chinese: 笑紅塵; simplified Chinese: 笑红尘; pinyin: Xiào Hóngchén; literally: "Laugh at a Secular World"), was performed in Mandarin by Sarah Chen. The theme song from The Swordsman, Chong Hoi Yat Sing Siu (traditional Chinese: 滄海一聲笑; simplified Chinese: 沧海一声笑; pinyin: Cānghǎi Yī Shēng Xiào; Jyutping: Cong1-hoi2 Jat1 Sing1 Siu3; literally: "A Sound of Laughter in the Vast Sea"), performed in Cantonese by Sam Hui in the first film, was played in a few scenes in Swordsman II. The film grossed HK$34,462,861 at the Hong Kong box office and remains as Jet Li's highest grossing film in Hong Kong to date.